Outages at cloud service providers like Amazon Web Services (AWS) highlight an unpleasant reality of using cloud services—many providers do not guarantee 100 percent uptime even though many organizations mistakenly assume they do. It is only by organizations first recognizing that “consumer” and “enterprise” grade cloud service providers exist that they can begin to select the right provider for them. In so doing, they may choose a cloud service provider that meets their existing requirements while positioning them to meet their needs of tomorrow. Yet it is here where organizations may get themselves into trouble as they may fail to articulate their unspoken expectations as to the features they assume a cloud service provider will deliver. An “enterprise” cloud service provider possesses the features found in a consumer grade cloud service provider plus the features that organizations assume an “enterprise” grade cloud service provider should provide. For example, an enterprise cloud service provider should provide options for delivering the appropriate amount of network bandwidth to meet an organization’s needs. This may be as simple as setting policies to prioritize traffic during times of peak activities. Or it may provide more advanced options such as supporting the introduction of new WAN links into its data center to meet the organization’s service level agreements (SLAs) for uploads and downloads of data. 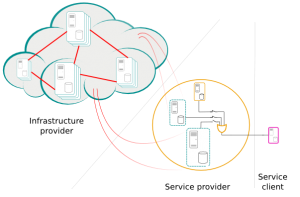 Availability, reliability and the stability of the infrastructure that the provider hosts should also be well documented. They should provide insight into and be able to control where the data is stored, on what tier of compute resources are applications run, the tiers of storage on which data is placed and the flexibility of choosing which location they want to store their data or where to recover their application. Armed with that knowledge, organizations may then set policies that define where they want to store their data or recover their applications. Further, if the importance of the application or data changes over time, they have the freedom to redefine the policies to either upgrade or downgrade the tiers of compute and storage resources on which their applications run and data is stored according to business needs, not artificial limitations imposed upon them by their cloud service provider. Companies increasingly know they want to move their computing to the cloud but want the confidence that as they do so, they can start slowly, then scale up using a provider that does not put their business at risk or burden them with unreasonable costs in the process. A good cloud provider understands the concerns of the enterprise, and has the technologies and roadmap to get them from where these businesses are today to where they want to be in the future. But more importantly, it has constructed both enterprise class data centers and an enterprise class cloud service offering so that when their customers arrive in the cloud, they will arrive there confidently and safely. Remember Cloud9 Real Time, we wrote the book on cloud-based application hosting for real-time access of data and accounting processes, and today we host more than 400 general and niche applications for accounting and legal professions, design, architecture, non-profit and more. Cloud9 was voted #1 private accounting cloud by more CPAs. Download white papers, get a demo, even take a 7-day test drive.